It is a long way down from the high country of Bach and the ideal of marriage to thoughts on cheese and crackers. Still, there’s harmony in the way certain edibles seem suited to each other, and the evidence of it is as sensible as it is in higher objects. 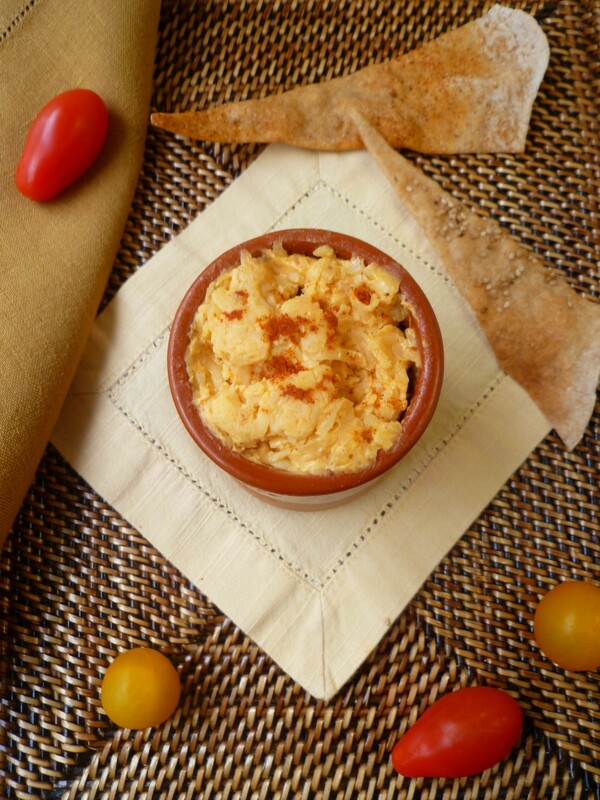 In the case of crackers with cheese, as with many other traditional combinations,….it’s in the taste. 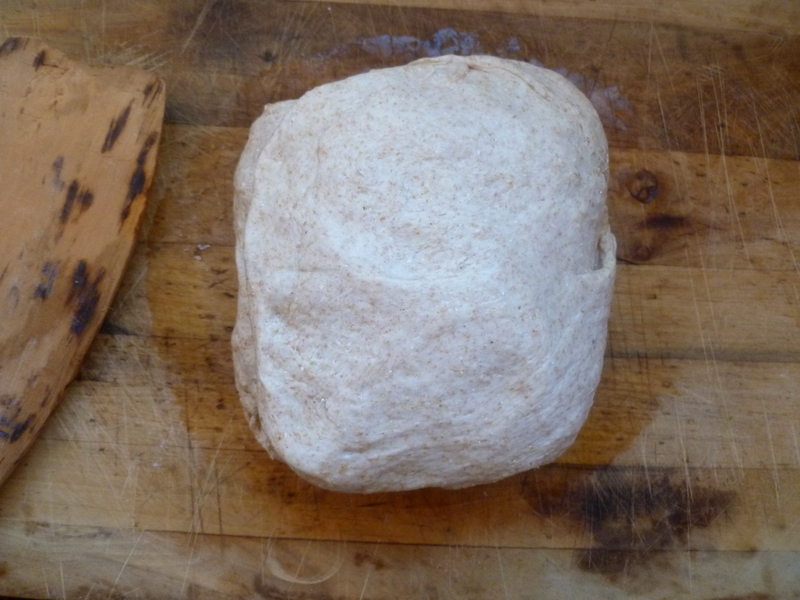 A Timing Note: After mixing the cracker dough, it is left to rise for about 2 hours. 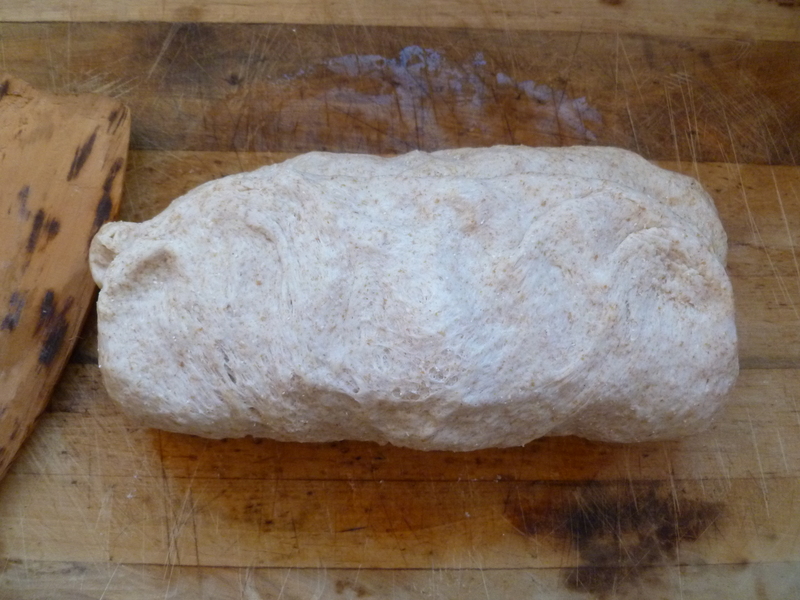 150 g Wholewheat Flour (1 cup, plus 1/8 cup, plus 1 teaspoon): Either regular or pastry flour will be fine. If using American measures, measure the flour by pouring it into the measuring cup and leveling it off. 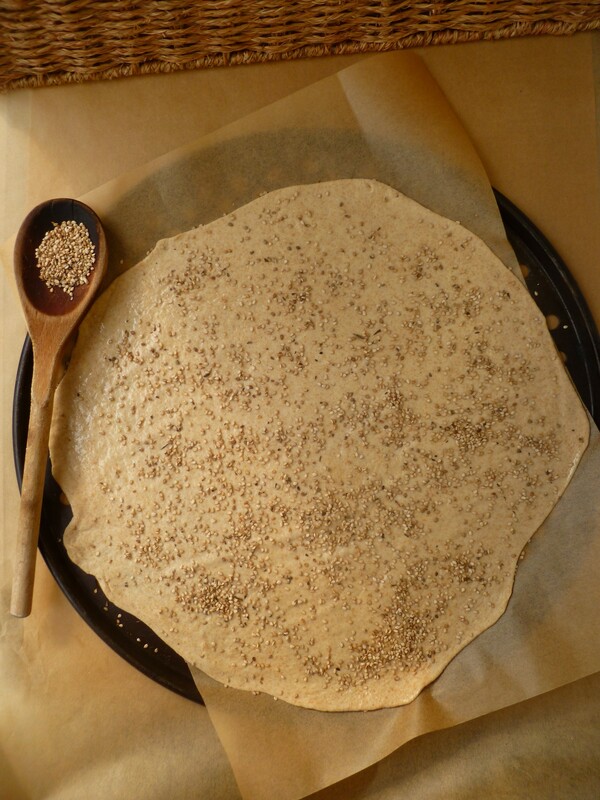 300 g White Unbleached Flour (2 and 1/4 cups): The dough is not sticky and no additional flour is required to sprinkle on the pastry board before rolling out the cracker dough. For American measures, measure the flour by pouring it into the measuring cup and leveling it off. Suggested Toppings for the Crackers: Some savoury topping possibilities are Sesame Seeds, Za’atar (see this previous dk post for information about Za’atar and how to make your own), and Carne Asada Powder (the recipe for Carne Asada Powder is here in this previous dk post). 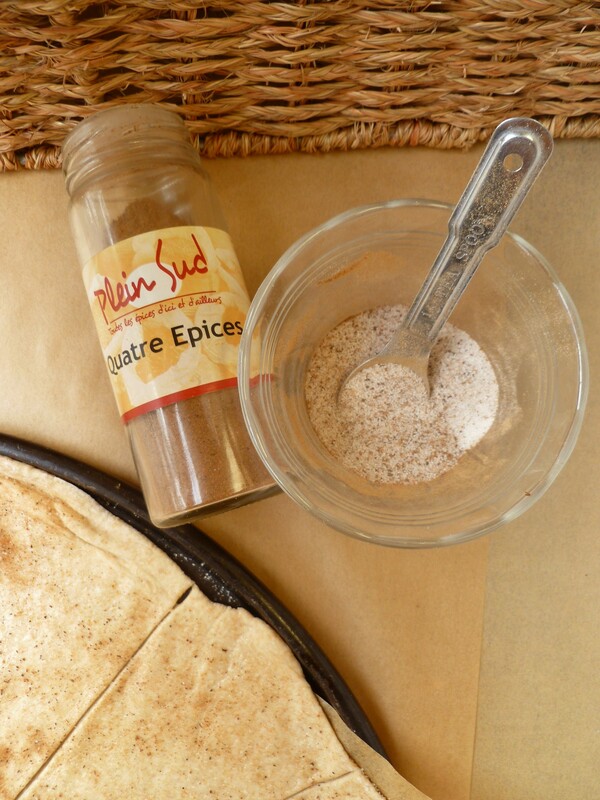 For a sweet version of the cracker, mix a teaspoon of Quatre Epices (a blend of pepper, cloves, nutmeg and ginger) with 1/8 cup of Granulated White Sugar or use a mixture of Sugar and Cinnamon. Sweet crackers could be served alongside an ice cream or pudding dessert. 2 Mixing Bowls: One for mixing the dough (the bowl of the mixer if you don’t mix the dough by hand) and another in which to let it rise. 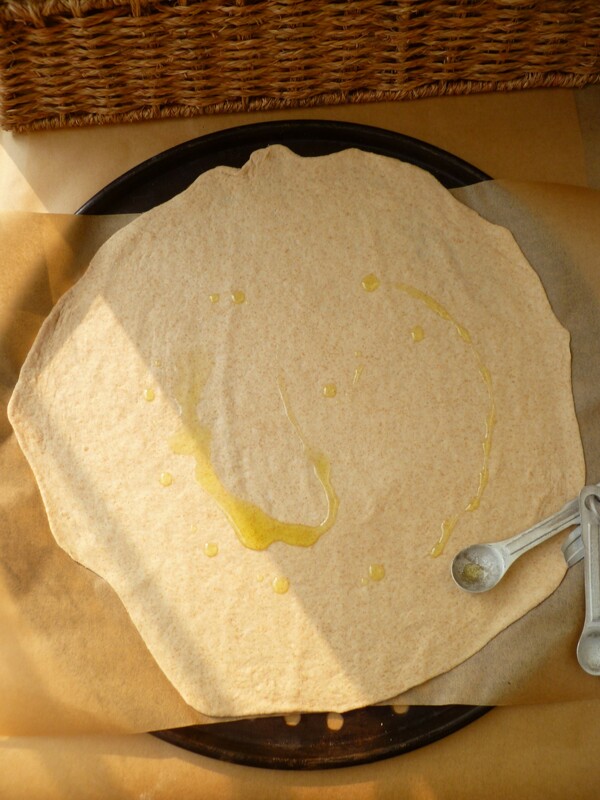 Pizza Pans or Baking Sheets lined with Parchment Paper: One pan and one sheet of parchment may be used multiple times. 1. 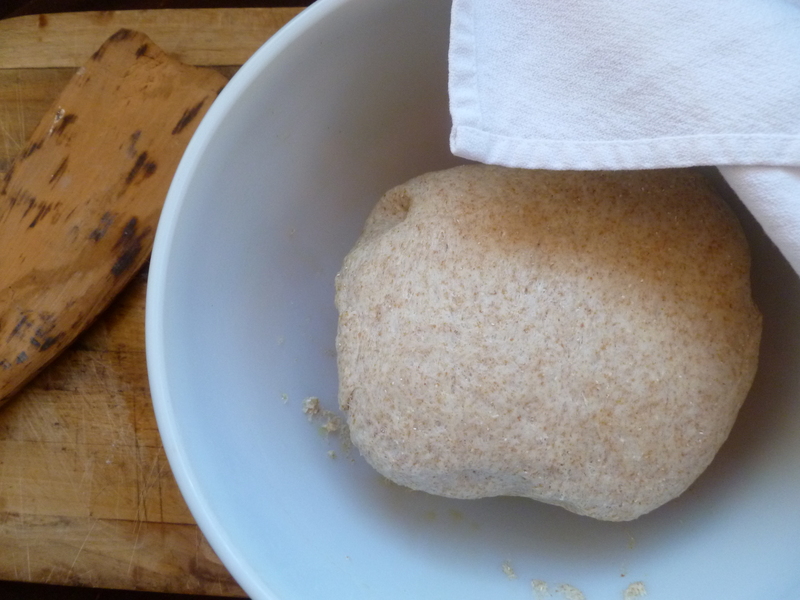 In one of the mixing bowls (the bowl of the mixer, if you’re not mixing the dough by hand), combine the wholewheat and white flours, the yeast, salt and cumin. 2. Fit the mixer with the Paddle attachment, turn it on, and slowly add the water to the dry ingredients, mixing until a dough forms and leaves the sides of the bowl clean. 3. 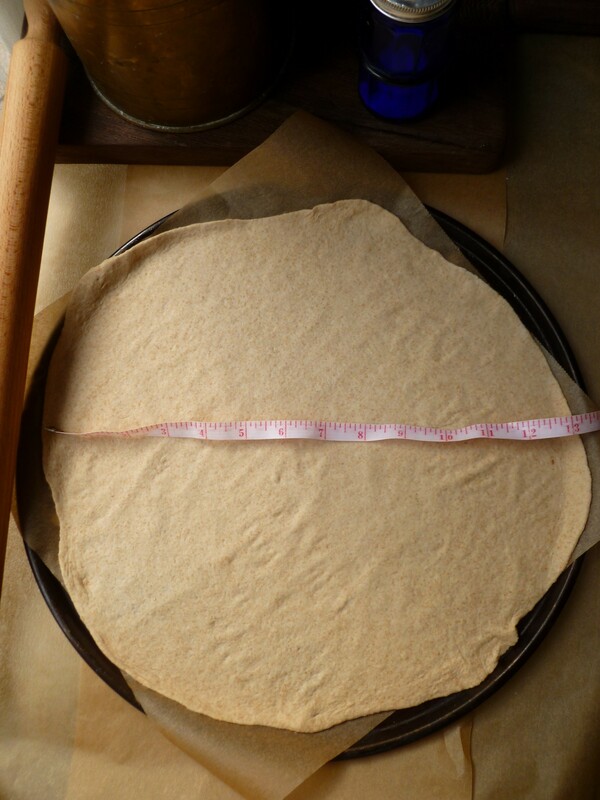 Turn the dough out on a pastry board. 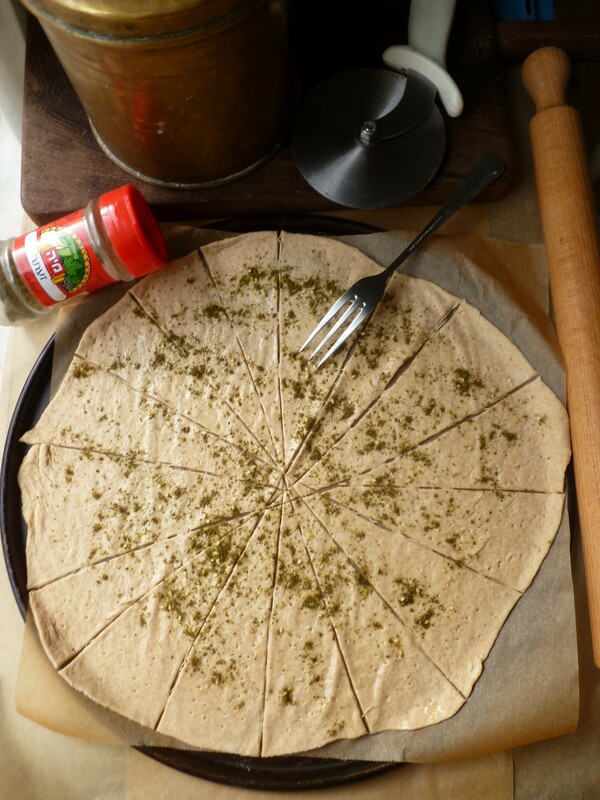 (The dough isn’t a sticky one and there’s probably no need to sprinkle the board with flour.) 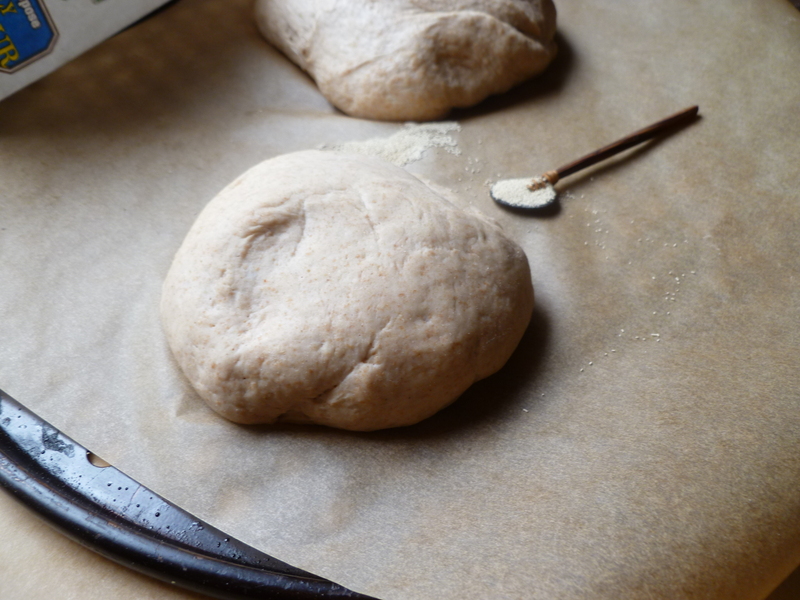 Knead it for a few seconds just to test by feel that the dough is well combined and form it into a ball. 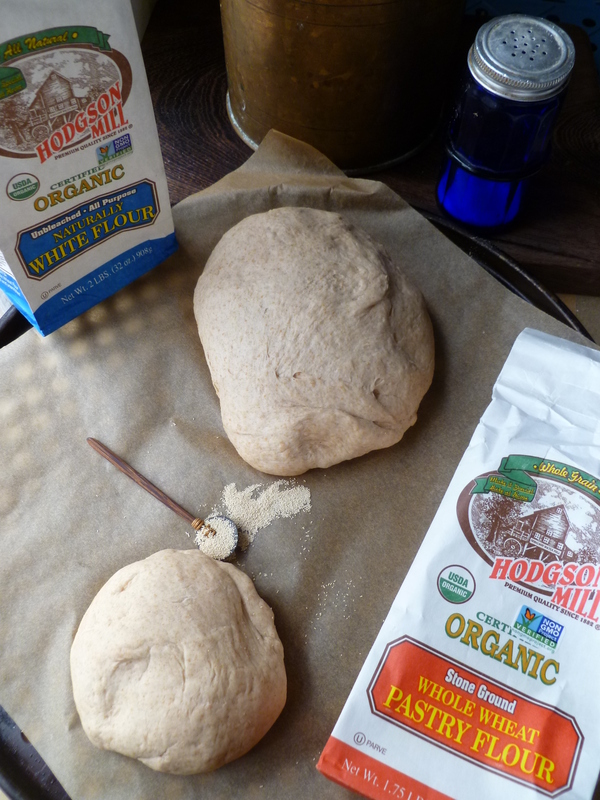 Turn the mixing bowl upside down over the dough and let the dough rest for 15 minutes. 4. While the dough rests, grease the second mixing bowl with olive oil. 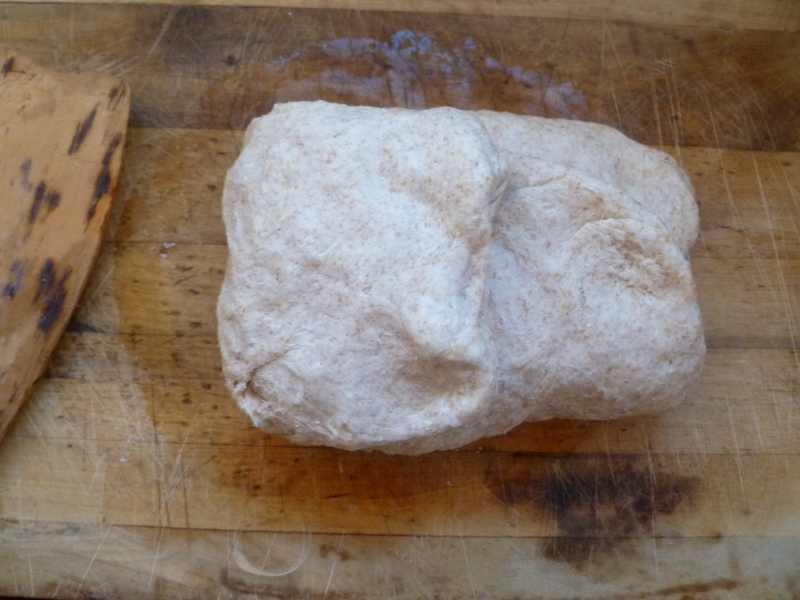 At the end of 15 minutes, knead the dough again for a minute before placing it in the greased bowl. Cover the bowl with plastic wrap and let the dough rise for 1 hour. 6. Fold the top third of the circle down to the center of the circle..
8. Put the dough back in the bowl, smooth side up, and let it rise for another hour. 8. Preheat the oven to 230 C (450 F). 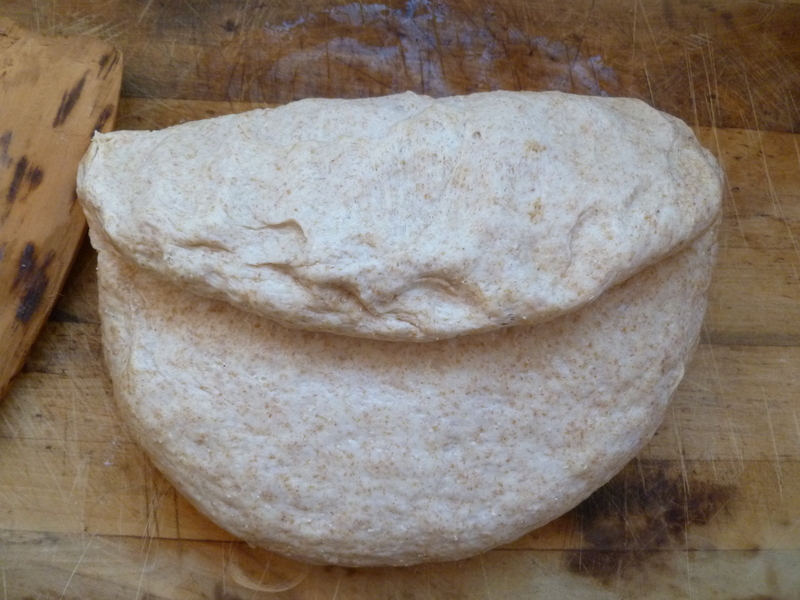 Divide the dough into two equal halves and divide each half again into two equal pieces. Roll each of the 4 pieces into a ball and cover them lightly with a cotton towel to prevent them from drying out. 9. Roll out one ball into a thin circle…about 13 inches in diameter. (The dough is neither dry nor sticky. The pastry board needn’t be floured.) 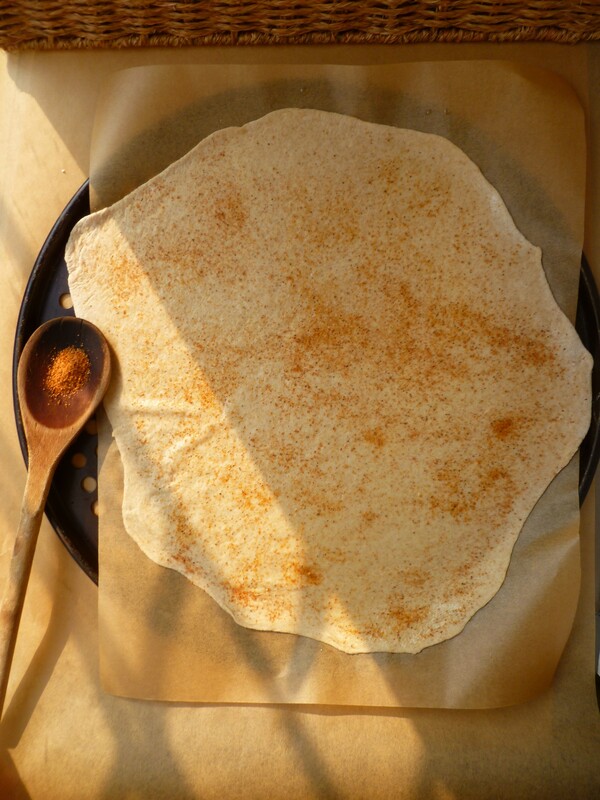 Flip the round over from time to time as you roll it out–this makes it easier to roll it thinly. 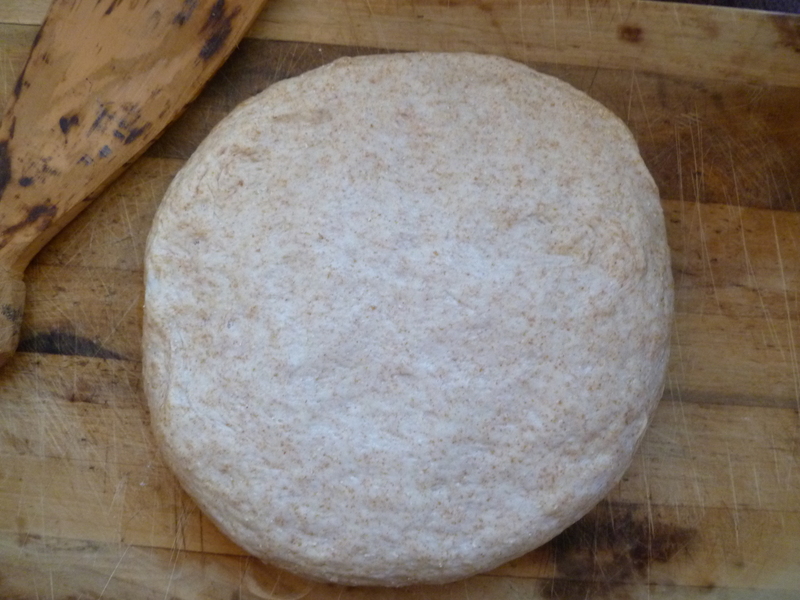 Then place the circle on a parchment-lined pizza pan or baking sheet. 11. Cut the round into 12, or up to 16 triangles and bake it in the preheated oven (230C/450F) for 4 minutes. Slide the paper out from under the crackers and continue baking them directly on the pan or baking sheet for 3 minutes more, or up to 8 minutes longer, to crisp them. The total baking time depends on the crackers’ thickness. All told, the total baking time may be up to 12 minutes. 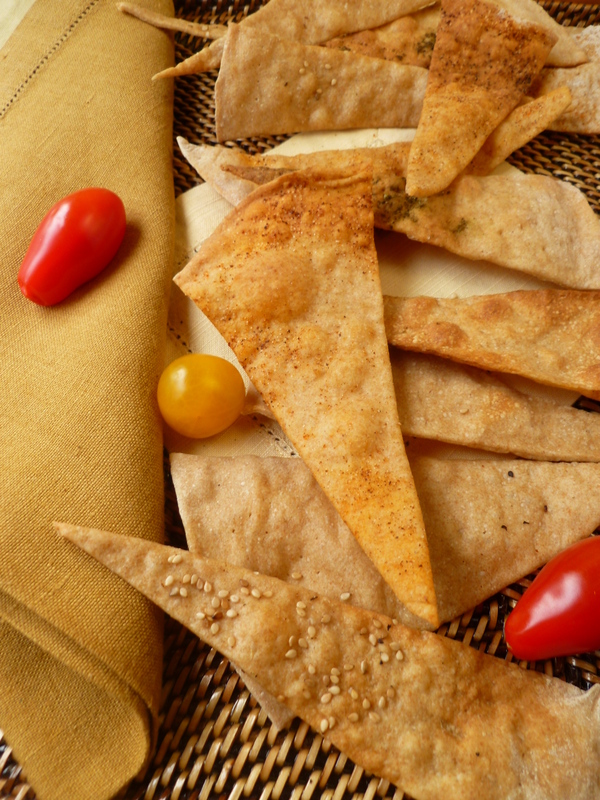 (If there are a few softer spots on crackers that are otherwise crisp and golden, take them out of the oven. They will continue to crisp a little as they cool.) Transfer the crackers to a rack to cool and make crackers from the remaining 3 rounds of dough in the same way, flavouring them with whatever combination of herbs and spices you like. 12. The crackers will keep for a long time stored in a tin. 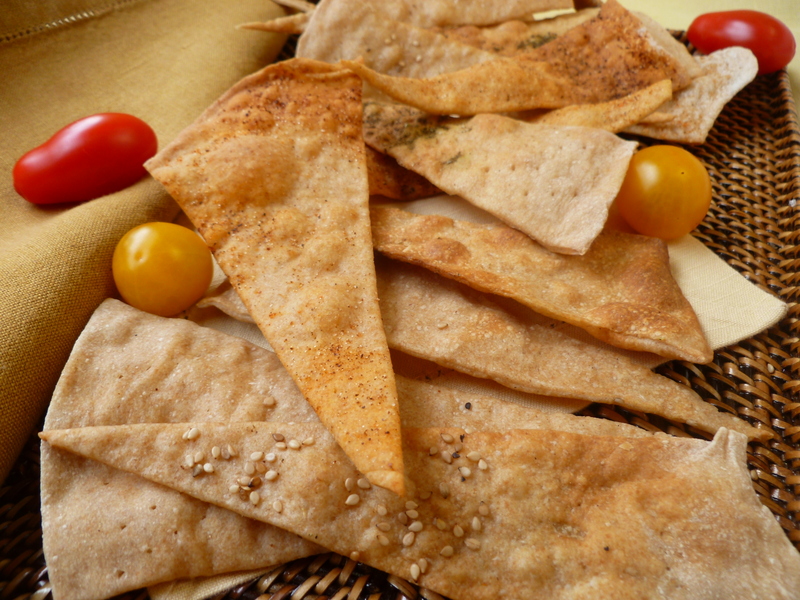 A Note and an Acknowledgement: Homemade Wholewheat Crackers are included with the Hors d’oeuvres in the Lunch Menu: A Cold Winter’s Day Luncheon Menu Reminiscent of Sunny Climes. 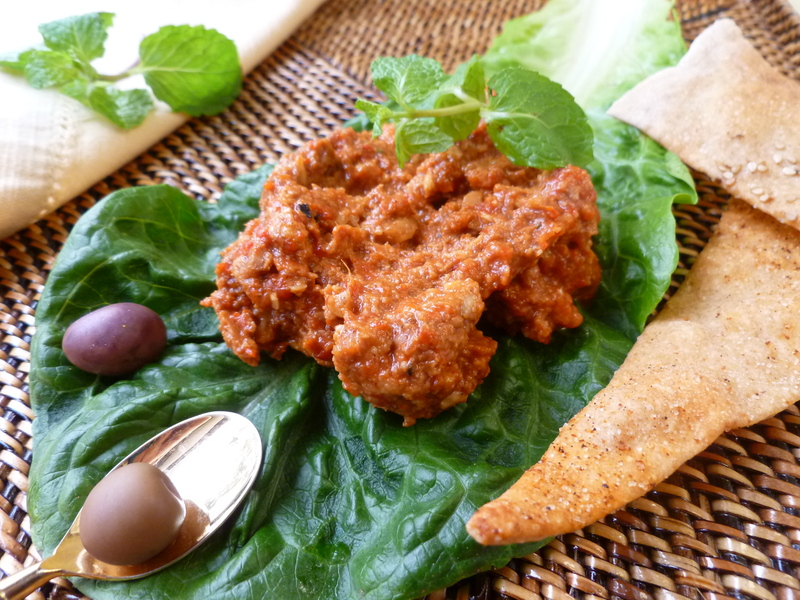 They combine harmoniously with the Muhammarah (Spicy Roasted Red Pepper and Walnut Spread) that is also included as an hors d’oeuvre in the Menu. The recipe is an adaptation of one by Anissa Helou, who writes about and cooks Mediterranean food. Here is a link to the blog on her website.